Earlier this summer, Bon Appetit ran an article about Frosé, or Frozen Rosé. Purportedly on of their most popular articles ever, I was definitely intrigued and heard that lots of trendy DC bars were serving this popular treat. The Washington Post even told me that Frosé is taking over Washington D.C. But now it’s the end of August, and I still haven’t made it to one of these bars yet. I was worried my dreams of trying this treat might be soon crushed. I read through the recipes online and came up with a quick and easy version that was straight-up-delicious. Like, I drank a bottle of wine delicious. 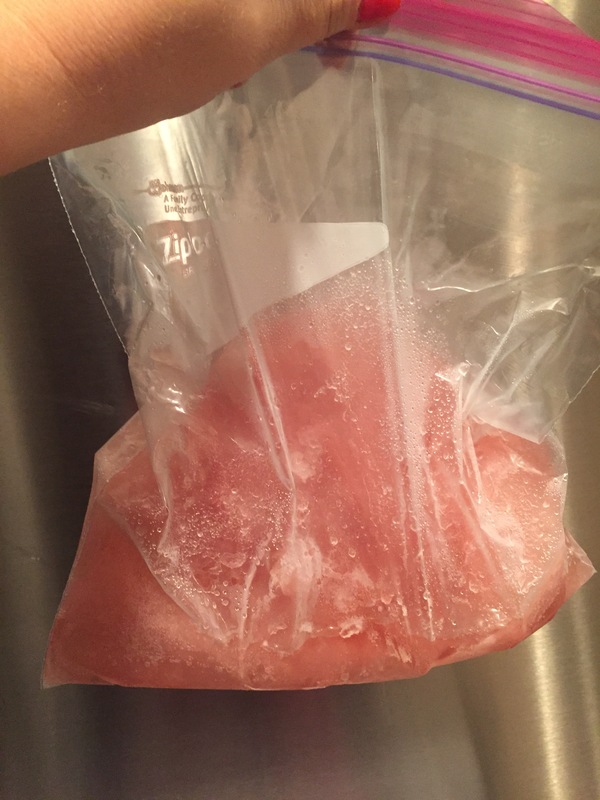 This also doesn’t make a ton, despite using a whole bottle of wine, so if you’re serving a group, freeze up a few bottles of wine. 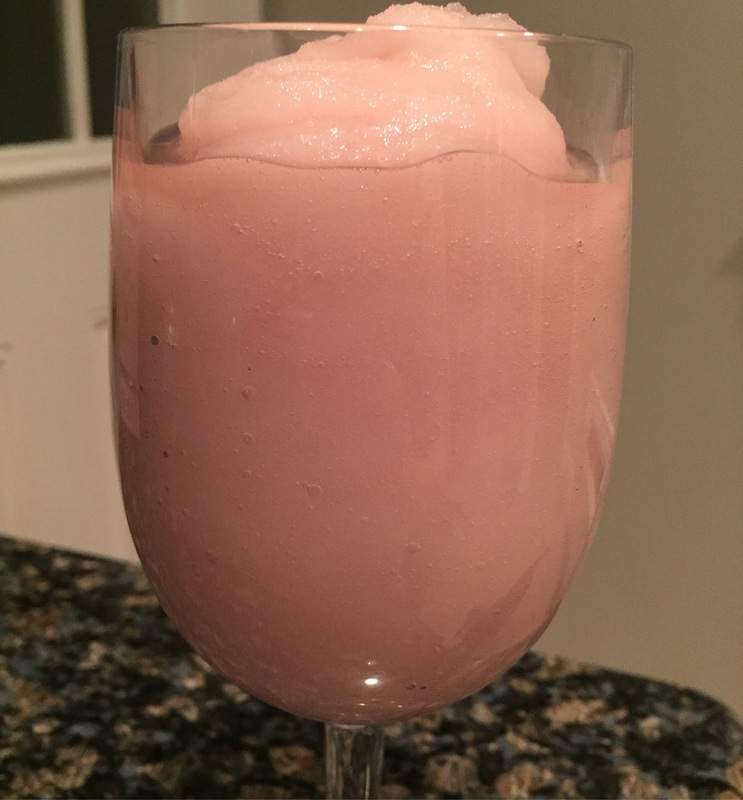 Add the frozen wine, simple syrup, and lemon juice to your blender and blend until smooth. Pour into a large wine glass and enjoy! There’s a fabulous sandwich shop in Tennessee called Ham ‘N Goodys. But what makes it really fabulous is the Goodys part of the name – they have a fantastic bakery with delicious cookies and cakes. The News Sentinel now supplies a difference version of the recipe, without cake mix, which I have also made and which is not as good. The only change I make from the recipe above is to cook the cookies at 350 instead of 375, as my oven runs hot. Combine the cake mix, lemon juice, oil, and eggs. Form balls about the size of golf balls. 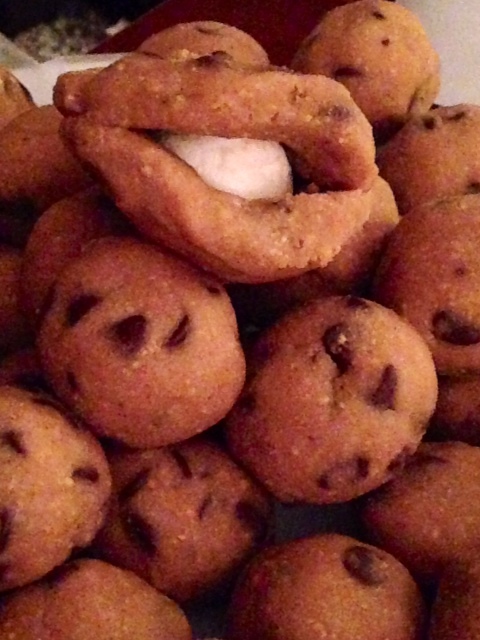 The larger the cookie, the softer they will be. At 350, you will need to cook them for 10 minutes. Combine the ingredients for the glaze and apply to the cookies. The original receipt says to let the cookies cool before doing this, but I don’t usually, and it’s fine. 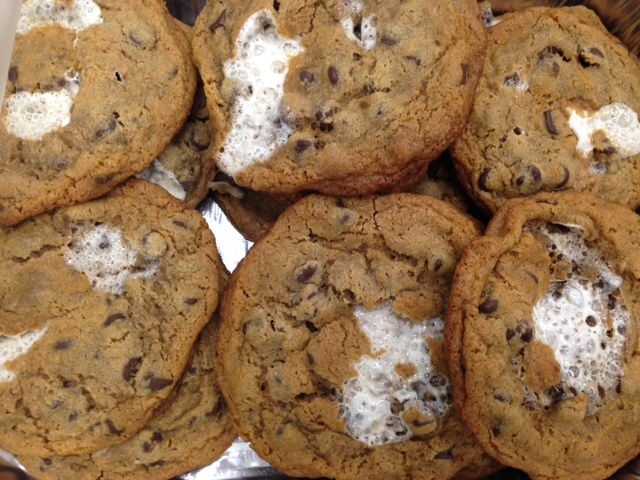 I have found one batch makes about 16 3-inch cookies. Let the glaze dry for a few hours and there you have it! This is one of the very first recipes my dad taught me how to make. 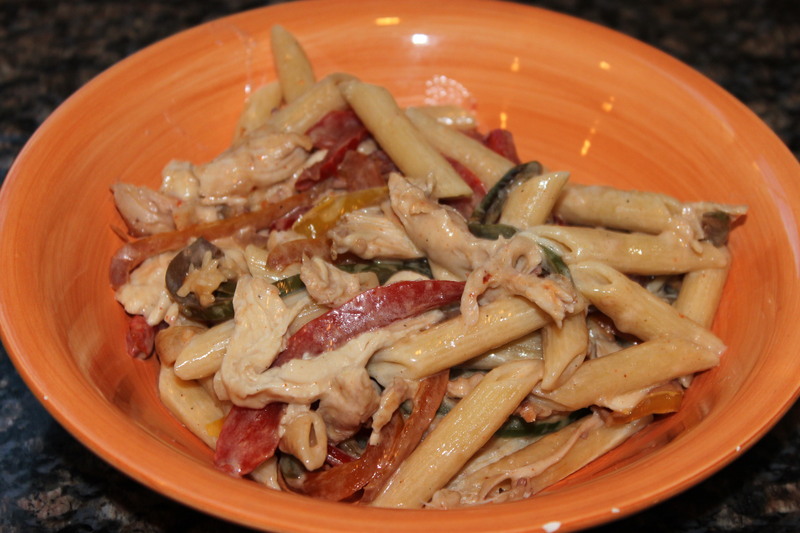 It is a wonderful combination of a light alfredo, grilled chicken, and colorful peppers. It serves a crowd, and it’s delicious! Slice the peppers into long thin strips about 1/8” wide. Combine with 1/4 cup onion. 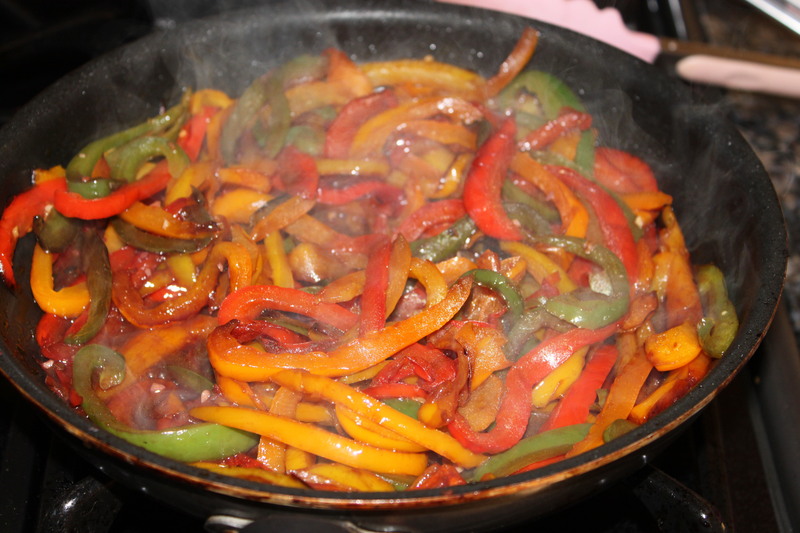 Saute the peppers and onion in just enough olive oil to cover the bottom of the pan. Cook only long enough to tenderize the peppers, then add 1/4 cup of wine. Simmer briefly and then turn heat to low to keep hot. 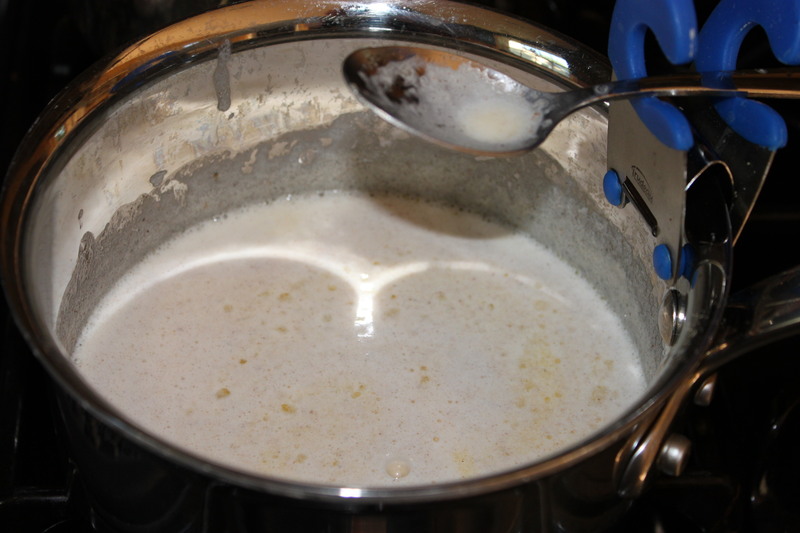 Combine the cream and butter for the alfredo sauce and heat slowly, stirring and reducing the volume somewhat. Prepare the pasta as you normally would. Strain pasta and rinse in hot water. Put pasta in a big bowl and add enough olive oil to keep it from sticking later. 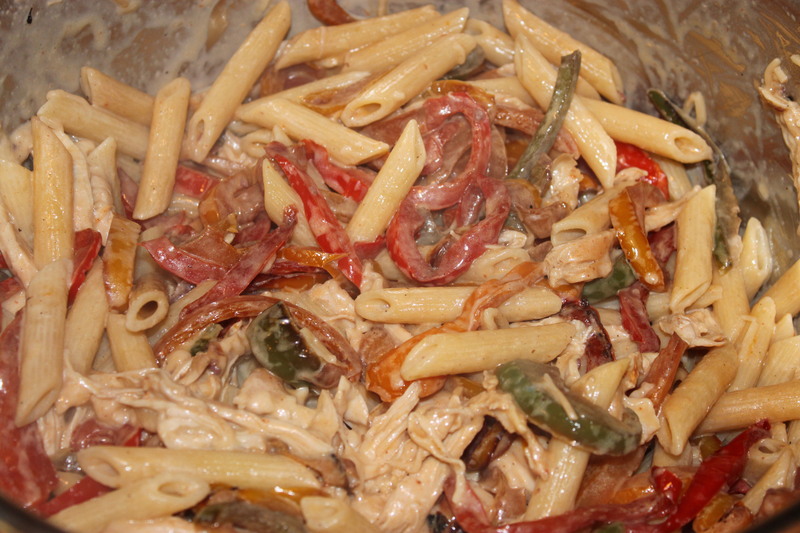 Pour off some of the liquid from the sauté, and add the remaining liquid, peppers and onions to the pasta (use your judgment in how much liquid to use). Add chicken strips and frozen peas next. Pour in parmesan cheese and the Alfredo sauce. I’ll admit, I’ve done a terrible job at keeping up with the blog. But I’m trapped in my house today, so I might as well get one post added. Just hoping it’s not my only post for 2016! Orange brownies used to be my go-to for UT tailgating. In fact, I’m shocked they are not already in the blog! Here they are in all of their creamy, citrusy glory. Recipe courtesy of Paula Deen. Then, preheat oven to 350 degrees F. Grease a 13 by 9 by 2-inch pan. Stir together flour, granulated sugar, and salt in a bowl. Add butter, eggs, orange extract, and orange zest. Using a handheld electric mixer, beat until well blended. Pour batter into prepared pan and bake for 30 minutes, or until light golden brown and set. Remove from oven, allow to cool and pierce entire cake with a fork. Spread the Orange Cream Cheese Frosting over completely cooled brownies. Cut into squares. In a large mixing bowl, whip the butter and cream cheese together with a hand-held electric mixer. Gradually beat in the confectioners’ sugar until it is all combined and smooth. Beat in the orange zest and juice. Spread over brownies. 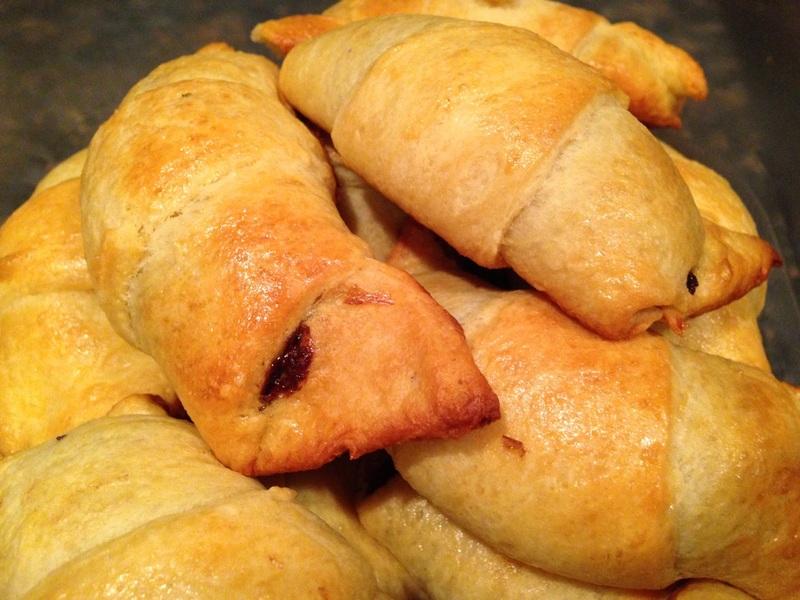 Five minutes from now, plus time for baking, you could be eating a warm, gooey Nutella croissant. Seriously! Can you think of one reason why you wouldn’t want to make that possibility a reality? I can’t either. Good, let’s get started. 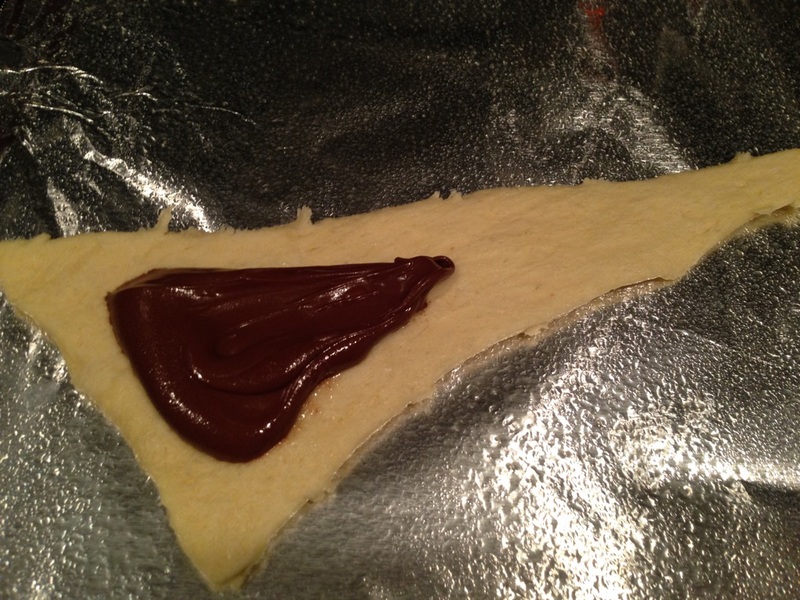 On each dough triangle, spread one tablespoon of Nutella. 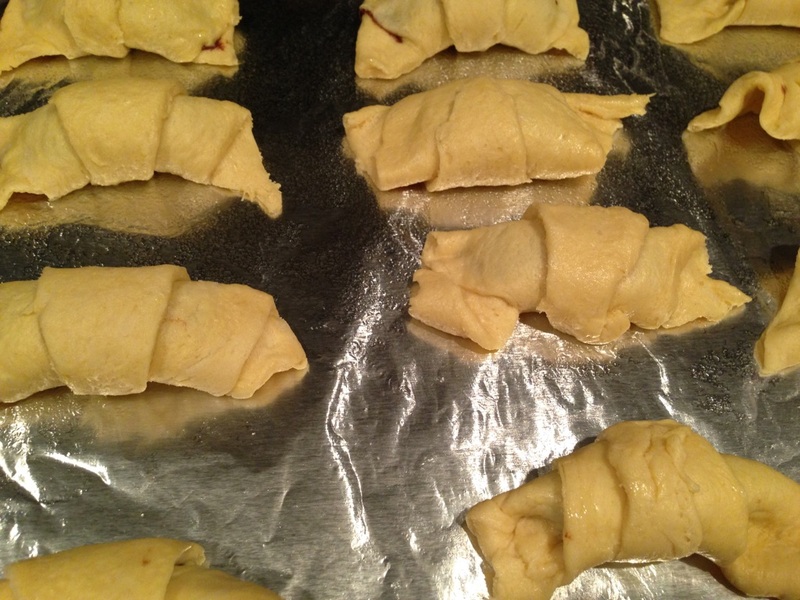 Roll up each crescent starting at the wide part of the dough. Now if you’re feeling fancy – brush each pastry with an egg wash. 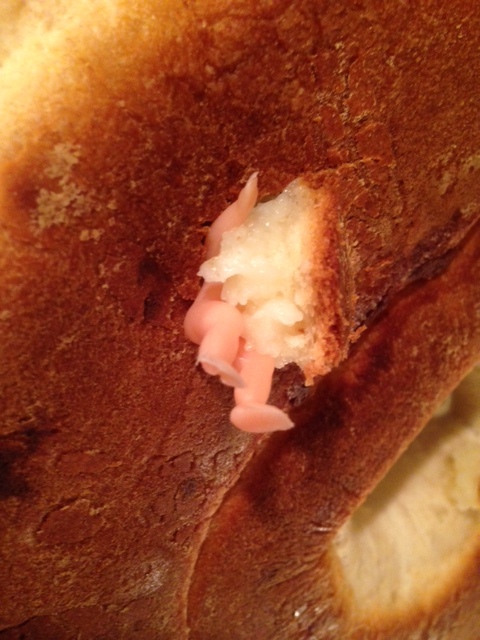 It will give the final product a light sheen like typical bakery pastries. Then they’re ready for the oven – bake for 10 minutes and you’re done! 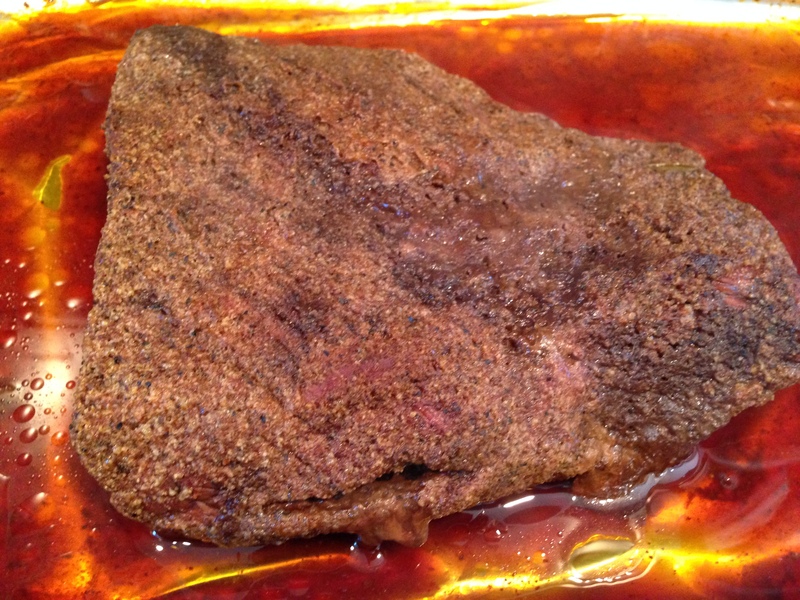 Ever since I got the Big Green Egg, someone will suggest from time to time that I smoke a brisket. This seems like a good idea, except for when I remember that I’ve never made a brisket, ever, via any method of cooking, so I had been reluctant to take the plunge. 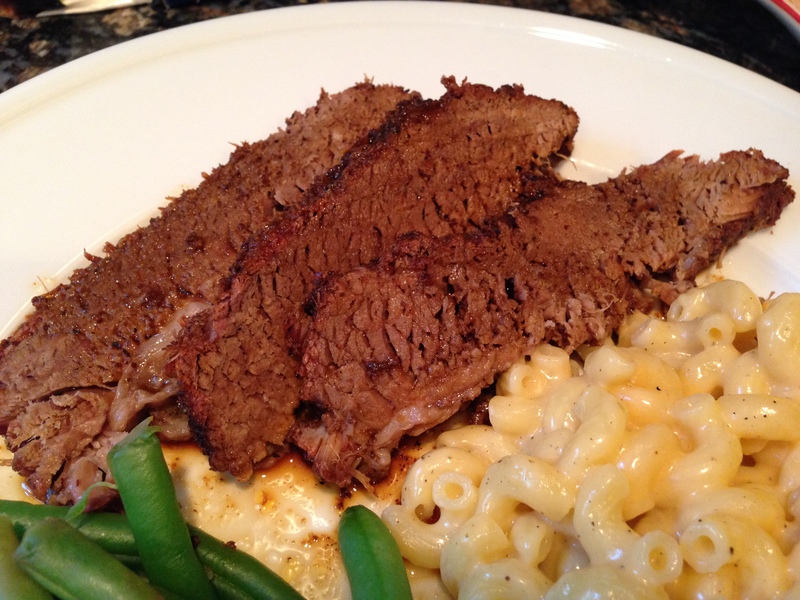 Then I saw a recipe for an oven roasted beef brisket, and honestly, this was so delicious, I’m not sure that I would ever try another cooking method! So you should make this too. Tonight! 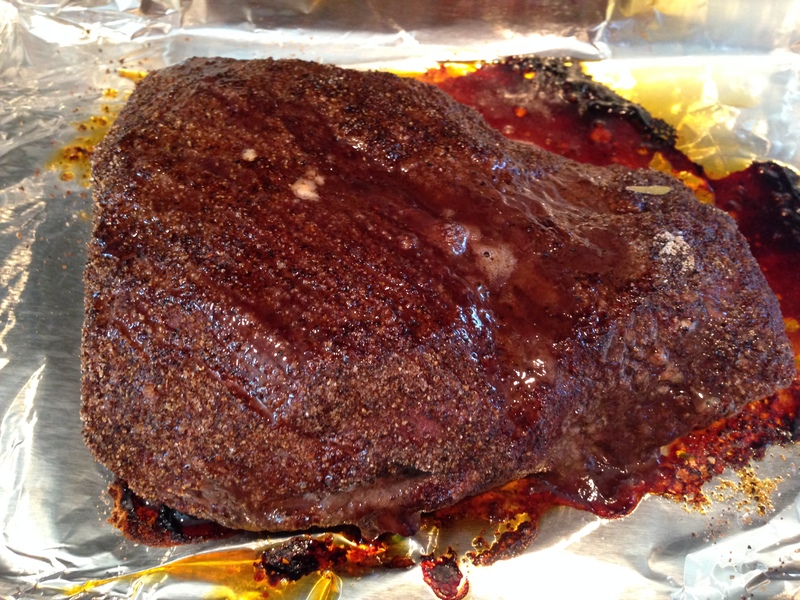 Make a dry rub by combining chili powder, salt, garlic and onion powders, black pepper, sugar, dry mustard, and bay leaf. 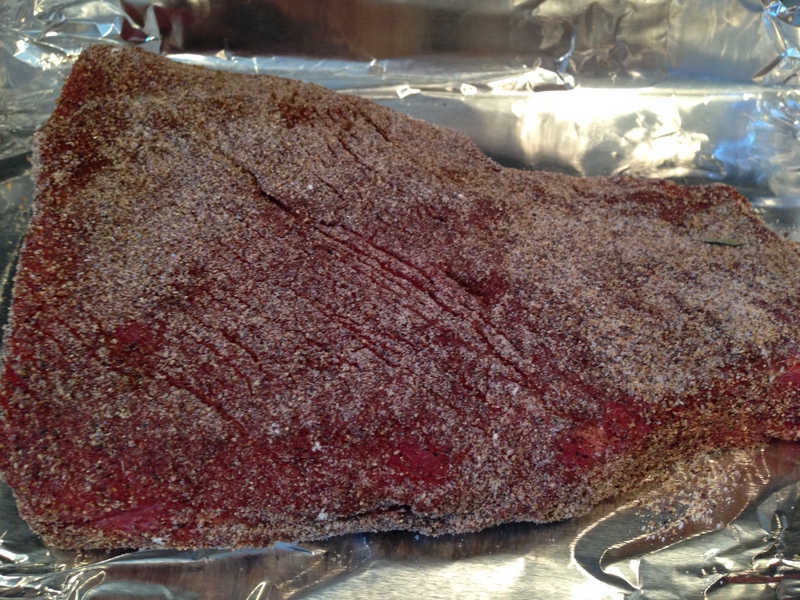 Season the raw brisket on both sides with the rub. Place in a roasting pan and roast, uncovered, for 1 hour. Add beef stock and enough water to yield about 1/2 inch of liquid in the roasting pan. Lower oven to 300 degrees F, cover pan tightly and continue cooking for 3 hours, or until fork-tender. Trim the fat and slice meat thinly across the grain. Top with juice from the pan. Lots of the juice. It’s delicious! Everyone loves pie! 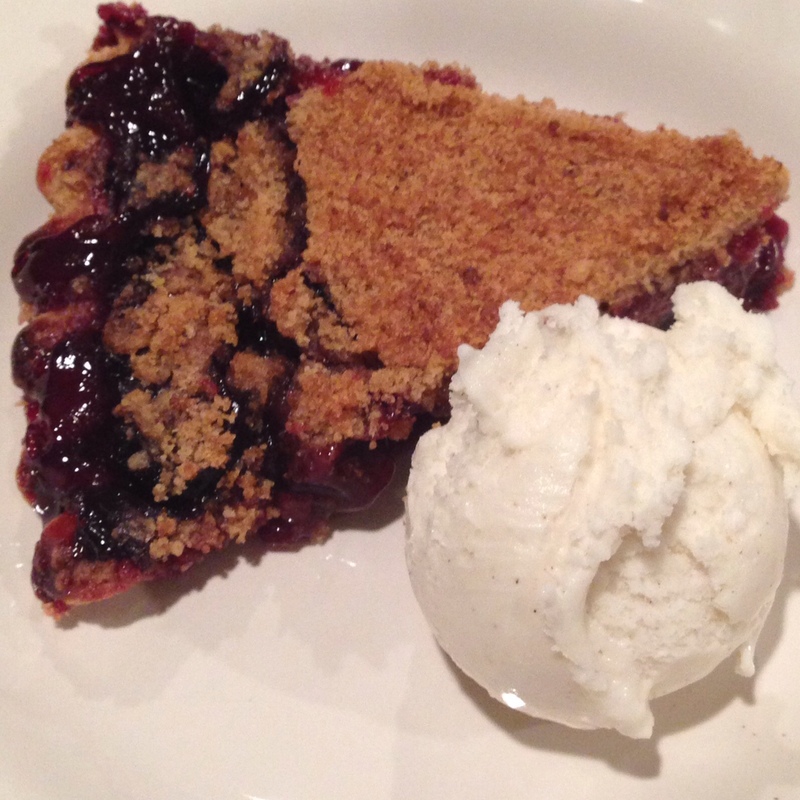 I prefer a streusel or crumb topped pie than a traditional pie crust topping, and so I combined a few recipes into this cherry pie. In a saucepan, combine the cherries, sugar, and cornstarch and bring it to a boil, stirring constantly. Reduce the heat and stir until the juices are translucent (just another minute or two). In a food processor (or with a pastry cutter), combine the flour, brown sugar, and butter until crumbly. 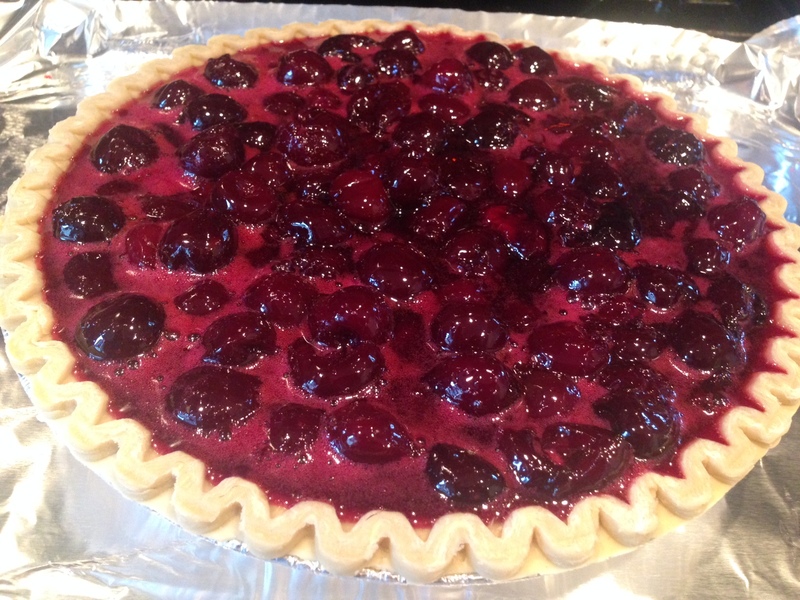 Allow the cherry mixture to cool, and pour them into the pie crust. 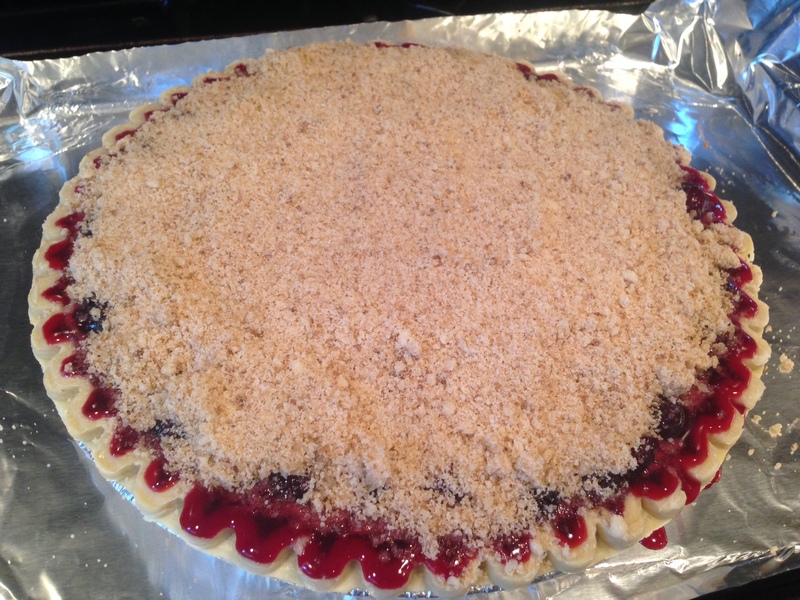 Top with the streusel topping, and bake in the preheated oven for 45 minutes. 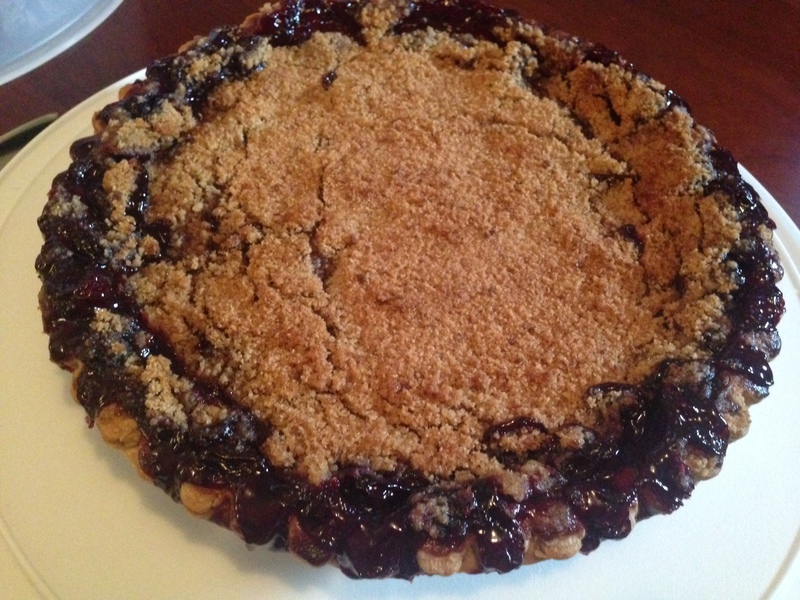 I recommend baking the pie on a foil lined pan to catch all the drips. Bacon wrapped scallops: the jackpot of the wedding cocktail hour. Don’t get me wrong, I enjoy a meatball, a mini crabcake, maybe even a stuffed mushroom. 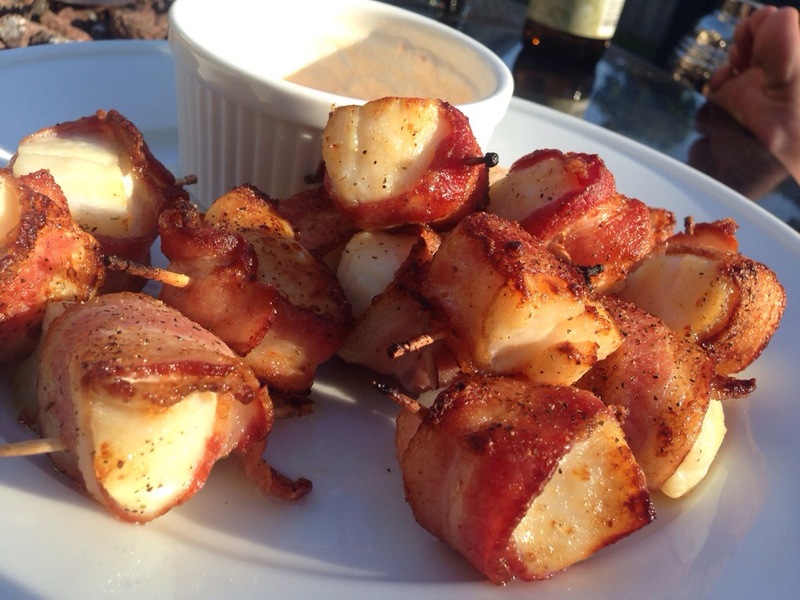 But if you’re looking for my husband at a wedding, just find the server with the tray of bacon wrapped scallops. He’s sure to be nearby. You don’t really need a recipe for bacon wrapped scallops, but this spicy chili mayo as an accompaniment makes this worthy of a post. I cut these scallops into halves (and sometimes thirds) with the goal of making these bite-sized. Preheat your broiler to 550. 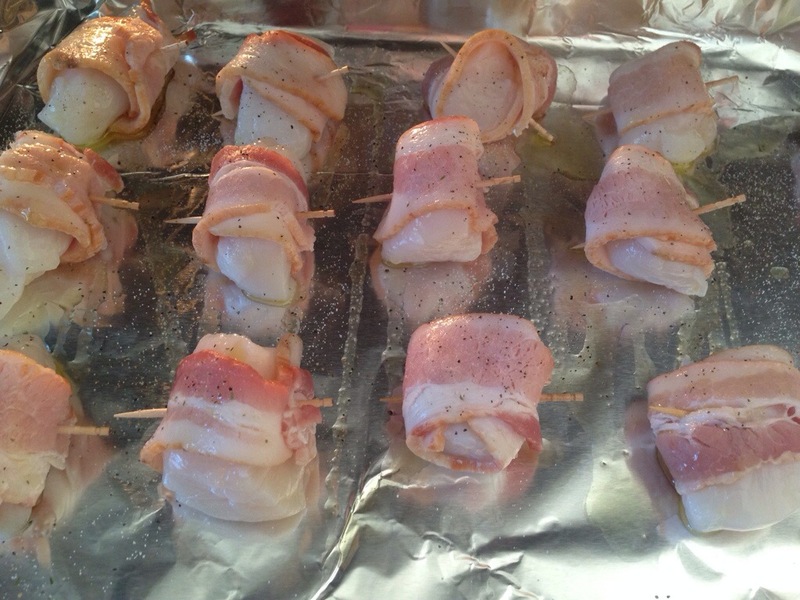 Wrap each scallop (or scallop piece) in half a piece of bacon; hold the bacon in place with a toothpick. Place on a cookie sheet. Drizzle with olive oil and sprinkle with salt and pepper. Broil for 15 minutes, turning once. Combine the mayo, chili paste, and rice vinegar, and serve with scallops! Couldn’t be easier. 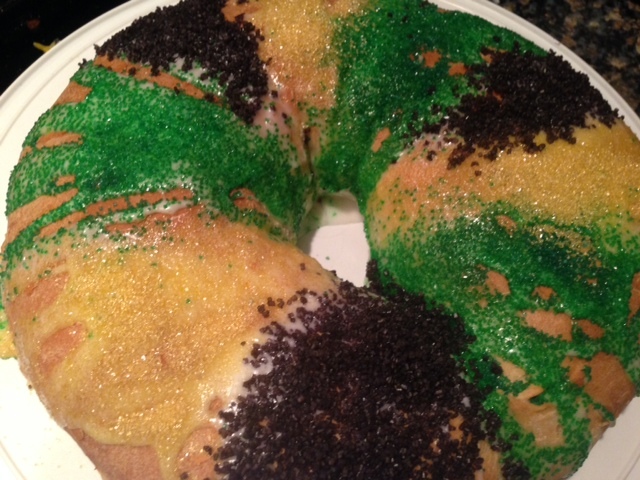 The last time I blogged about King Cake was in 2010, and I was in a rush and didn’t include the recipe. That version was a very simple one which you’ll find on the Internet that uses refrigerated sweet dough, like crescent roll dough or cinnamon roll dough. But traditional King Cake is made from a sweet, yeast-risen dough (more like bread), sometimes filled with a cinnamon mixture, sometimes filled with a cream cheese custard. 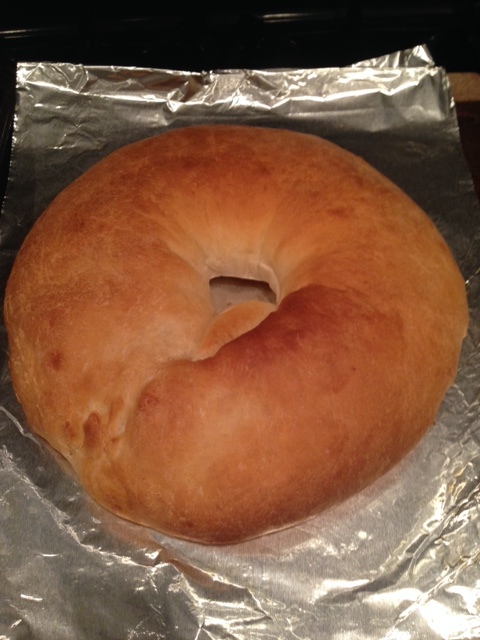 So this year I set out to make a more traditional King Cake, with a basic white bread dough and an orange-flavored cream cheese filling. 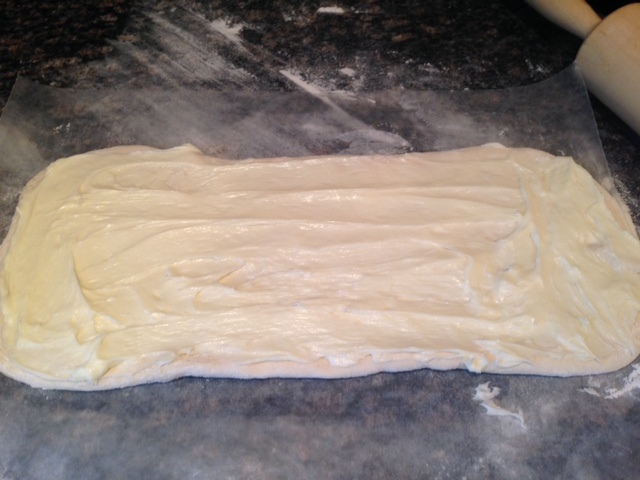 On a floured surface, roll your dough out to roughly an 8×16 rectangle. Using an electric mixer, combine the cream cheese, 1 cup powdered sugar, and orange extract until smooth. Spread over the dough, leaving a little bit of room at the edges to help with a seal. 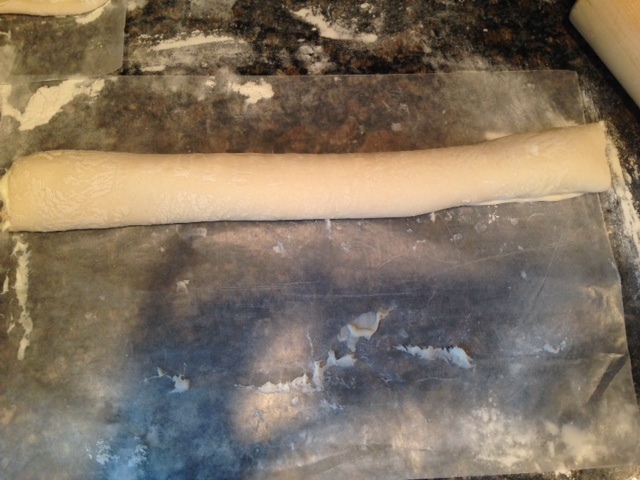 Roll the dough up into a cylinder length wise. 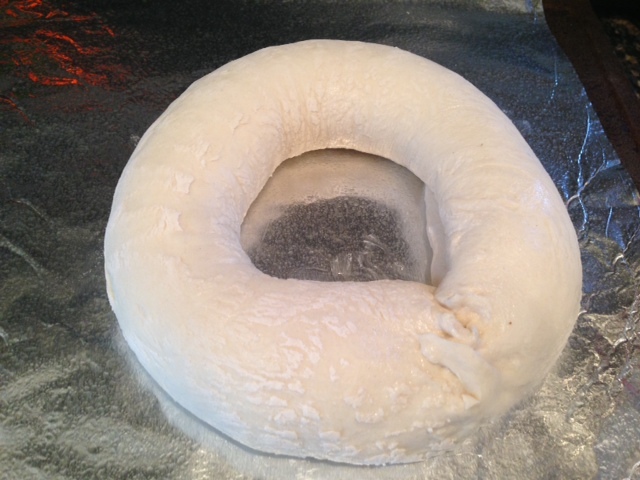 Create a ring from the dough, sealing with wet fingers if the dough is too dry. 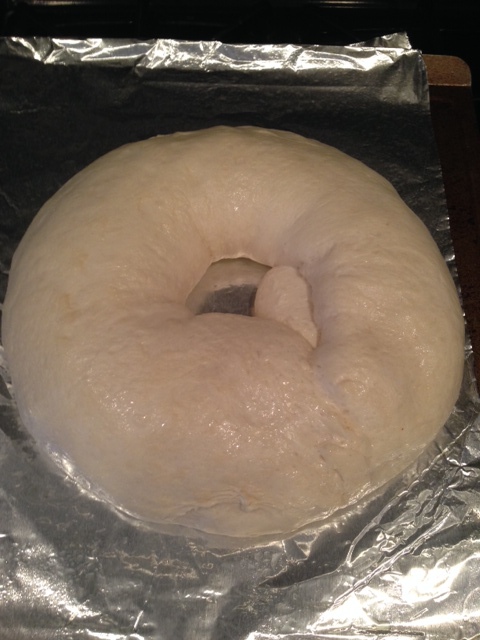 Lightly spray the dough ring with cooking spray, cover with plastic wrap, and let rise in a warm place for at least an hour, until your dough has roughly doubled. Bake for 30 minutes in an oven preheated to 350 degrees. After the cake cools, combine the powdered sugar, milk, and extract into a glaze, and drizzle over the cake, decorating immediately with the colored sugars. March 3 and it’s another snow day here in DC! 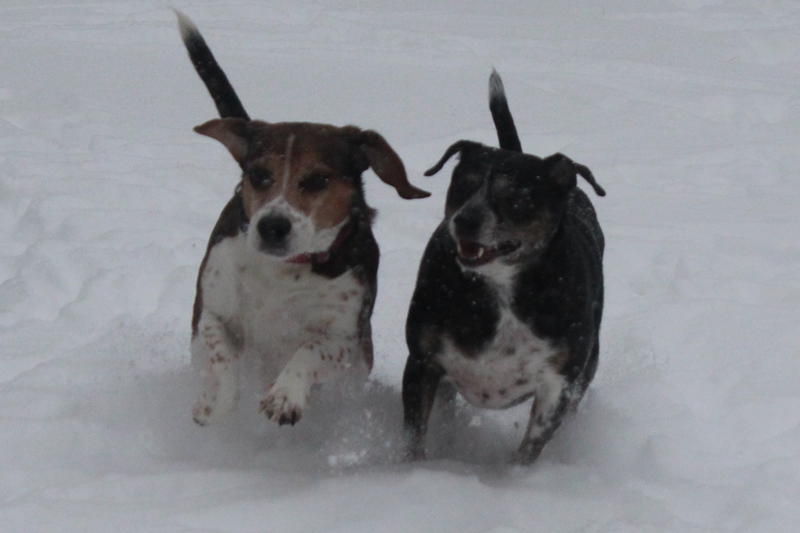 We’re ready for spring… but enjoying the snow while it is here. 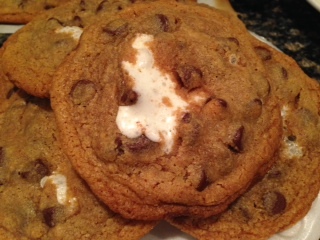 These S’mores Cookies are a perfect snow day treat. Cream the softened butter, sugar & brown sugar in a stand mixer. Add the eggs in one at a time. Add the vanilla and mix. In a separate bowl, sift the flour, baking soda & salt. Add the graham cracker crumbs and mix together. Add the flour and graham cracker crumb to the wet ingredients in about 3 increments, scraping the bowl down in between. Mix until combined. Add the chocolate chips and mix all together until combined. Refrigerate the dough for at least 30 minutes. While refrigerating the dough, preheat the oven to 375. Roll your large marshmallows into a ball. Line cookie baking sheets with parchment paper. Using an ice cream scoop scooper size, scoop out a portion of cookie dough and divide into two discs. Place your rolled marshmallow between the two discs and seal around the edges. These spread quite a lot, so be sure to place them at least 2-3 inches apart on your parchment lined cookie sheet. Bake in the preheated oven for 8-10 minutes, rotating halfway in between. Let cool 5-8 minutes. Yum!